Beware Ozone air purifiers! Marketers are peddling electronic ozone machines to consumers without understanding the public health implications they create. In fact, thousands of people have been harmed by these "evil air cleaners" which are designed to emit highly reactive triple bonded oxygen molecules into your indoor air. These Ozone air purifiers basically fill your rooms with highly reactive free radicals of oxygen which will be inhaled deeply into your lungs where both acute and chronic damage may occur. Any benefit to Ozone air purification is far outweighed by the discomfort and respiratory distress they will likely produce. Ozone: Good Up High, Bad Down Low! It is true, Ozone (also referred by the snake-oil salesmen as "activated oxygen", "superoxygen", or "saturated oxygen", "energized oxygen", "trivalent oxygen", "allotropic oxygen", "super-oxygen", or "mountain-fresh air") is beneficial in the upper levels of Earth's atmosphere. It can also be beneficial for certain industrial applications and that (and a lack of Ozone air purifier regulations) is where some of the confusion that caused Ozone air purifiers to flood the market comes from. The Wonderful Wizard of Oz? Ozone is produced by lightening in the atmosphere and is a very important molecule in nature; however, so is rattlesnake venom - depending on where it gets deposited! 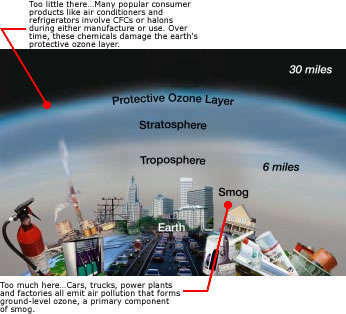 It's easy to be confused about Ozone since we hear so much about how atmospheric Ozone protects us from UV and radiation and how a hole in the Ozone layer is a bad thing. Most consumers are unaware of Ozone's detriment at ground levels. This is why the EPA has launched the "good up high, bad down low" initiative in order to educate the public about the dangers of Ozone at ground levels. It's the public's misconception about Ozone gas that the makers of "Ozonators" use to their advantage. Ozonolysis: Smoke on the Water? Like the popular ozone air purifiers household Ozone water purifiers have also been a hot item for consumers recently and there is evidence that ozone water purification is somewhat effective at killing bacteria when food or objects are cleaned with the ozone infused water from these machines. It's probably only a matter of time before whole house water filter ozone purifier systems hit the market if they havn't already. It's important to note that there is little health concern when Ozone is dissolved in water compared to when an Ozone air purifier releases it into the air. In water the Ozone molecules are very short lived (less than one hour) compared to in the air where they may survive for longer periods of time (up to several days). 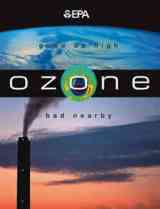 Ozone: KILLS Two Birds With One Stone - Are You the Third! When Ozone comes in contact with water such as in Ozone water purifiers, in municipal Ozonolysis water treatment tanks, in your eyes, in your nose, in your throat, in your lungs, or in the air it becomes hydrogen peroxide which is a powerful bleach and oxidant. This is what accounts for the reported "sweet" or "clean bleach-like" smell emitted by Ozone air cleaners. This odor is in fact one of the selling points that marketers don't want to elliminate by removing the potentially damaging Ozone emmisions from their mediocre ionic air purifiers. The fresh scent produced by some popular Ozone air cleaners gives consumers the ellusion that their room air cleaner is actually cleaning their room air; however, what they are smelling is tissue damage! After a few hours of exposure to Ozone your sense of smell deadens to the point where you probably will have trouble smelling that "fresh scent" much less everything else. Eventually you may experience chest pains, coughing, wheezing, and extreme sensitivity to many other allergy triggers like mold spores, smoke, pollen, or chemicals. 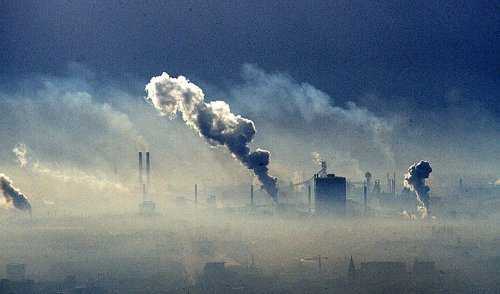 Permanant lung damage is also likely after prolonged Ozone inhallation. This is probably why ground level Ozone in Urban smog has been implicated as one of the primary agents contributing to increased death rates in urban areas where air quality is poorest. One little known fact about Ozone is that when it reacts with organic vapors commonly emitted by room air fresheners and cleaning products containing lemon scent (limonene) or pine scent another dangerous airborne gas known as Formaldehyde results. This is just one more reason in a long list of reasons to elliminate household chemical products like air fresheners and chemical cleaners from your home. To identify over 100 additional household chemical dangers in various rooms of your home you should visit our World Wide Web famous Household Chemical Encyclopedia. Formaldehyde is the most common respiratory irritant and cancer causing gas in most homes. Visit our extensive guide to Formaldehyde for much more specific imformation. For much more specific information about the dangers of Ozone air purifiers we have assembled an extensive guide to Ozone air cleaners, which also has an updated list of brands of Ozone machines to avoid. Ozone air purification is also used by professionals for smoke odor removal following fire damage in buildings and also in the hospitality industry for deodorizing hotel rooms. High levels of Ozone (50-100 times the outdoor EPA limit) are utilized in high Ozone shock treatments for whole house mold remediation also. However, the strong oxidative mechanism by which Ozone neutralizes other airborne molecules like polycyclic-aromatic-hydrocarbons (PAHs) and mold spores is the same mechanism that results in Ozone's destructive abilities to the organic molecules that make up your respiratory tract. Therefore, Ozone (O3) is a strong respiratory system irritant and can damage your lungs and cause some serious breathing problems especially if you are an asthma or allergy sufferer. Oh and by the way, Ozone also damages houseplants quite effectively as one more clue to Ozone's detriment. The professional ozone air purifiers for odor destruction are typically only used in unoccupied areas due to the health hazards of inhaling Ozone gas. Despite the dangers of Ozone inhallation, in the last ten years there has been a barage of room air purifiers hitting the market which are either intentionally designed to employ Ozone air purification or which unintentionally emit Ozone as a by-product. Passive emitters of Ozone in your home are actually quite common - some examples being most electronic devices like computers, TVs, and hair dryers. Actually all ionic air cleaners (many being of the filterless air purifier family) emit some amount of Ozone due the electronic air purification mechanisms by which they work. These room air cleaners use an electromagnetic field to induce charged particles or ions in order to attract air pollutants to collector plates or filters. It is the ionization process that converts beneficial oxygen molecules (O2) into highly reactive Ozone (O3). Many electronic air filters emit Ozone gas levels in excess of the FDA's indoor medical device limit of .05 parts per million (ppm) and may also exceed the Environmental Protection Agency's (EPA) outdoor Ozone limits as well. However it is difficult to ban these Ozonator air purifiers with extremely concentrated Ozone emmissions because there is no law setting household indoor air limits of Ozone emmision for air cleaners which aren't technically medical devices. Therefore, Ozone air purifiers slip through the regulatory cracks and marketers are free to continue peddling these little "blue-light" specials with big hidden "red-light" drawbacks. Many of these Ozone room air cleaners are filterless air purifiers so they don't remove the particles from indoor air, another very big downside. Several personal air purifiers worn around the neck are available as are purifers for the refrigerator and Ozone air cleaners for cars. As if you weren't breathing enough ozone from car exhaust fumes while on the highway! Photocatalytic Oxidation and Plasmacluster: New Kids on the Block! Air cleaner technology has advanced significantly with the introduction of Photocatalytic Oxidation (PCO) and Plasmacluster Ionic air purification. Both ionic air purifier technologies promise to raise the before dubious reputation of ionic air purification to new levels. PCO and Plasmacluster air purifiers also emit very low levels of Ozone gas molecules and are quiet effective at destroying lung penetrating particles and volatile organic compounds, three very big pluses. 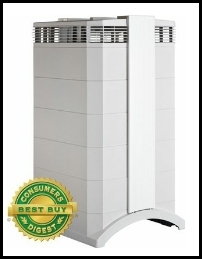 The Sharp Plasmacluster FPN60CX is the top selling air purifier in Japan. Japan is definately on the vanguard of technological innovation and Sharp's Plasmacluster air purifier is a perfect example. 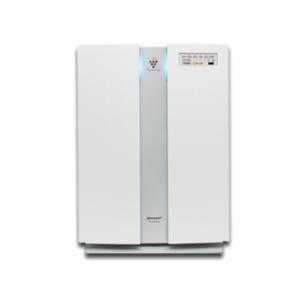 The plasmacluster FPN60CX is also quickly advancing up the air purifier ladder in many other countries in that region. 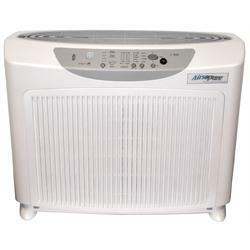 Learn why the Sharp Plasmacluster FP-N60CX is the best ionic air purifier. Photocatalytic Oxidation (PCO), like the Plasmacluster, also destroys gaseous indoor air pollutants without the use of Ozone. PCO is particularly effective at destroying a large number of volatile organic compounds (VOCs) by converting them to harmless Carbon Dioxide (CO2) gas and water (H2O). This is the same molecules exhaled by you and I during the breathing process. At the heart of Photocatalytic Oxidation is a catalyst coated Fluorescent or UV lamp. The inexpensive semiconducting Titania (TiO2) catalyst together with near-UV light waves is a low energy, yet effective method for reducing even low levels of airborne pollutants. The cheap catalyst does its job at room temperatures and only a low-intensity UV lamp is needed so cost of operation is low. Humidity does not effect the Titanium Dioxide catalyst activity and chlorinated organics common in indoor air do not damage the catalyst either. With the addition of Platinum (Pt) atoms to the Titanium Dioxide the photocatalytic oxidation activity increases even more for certain organic destructions. One example of a room air cleaner claiming to utilize Photo catalytic oxidation technology is the Airsopure MS-980 which claims to incorporate seven forms of technology in its air cleaner. It has a HEPA air filter, activated carbon filter, and UltraViolet air purifier technology in the form of Photocatalytic oxidation. IQ Air - Swiss makers of the best of the best air purifiers which are also Ozone-free.